BEDFORD, Mass. – Feb. 1, 2017 – VoltDB, the enterprise-class database that powers business-critical applications in today’s connected economy, has unveiled the latest version of its flagship solution, VoltDB v7.0. A broad range of Industries, including telecommunications, mobile gaming, advertising, casinos and financial services—any company that needs to ingest, analyze and act on data in the moment—rely on VoltDB to power faster, more intelligent applications to make the right decisions, when time matters. The world’s fastest in-memory SQL database, VoltDB v7.0 is now available in a comprehensive range of new licensing terms, for both on-premise and in-cloud deployments. 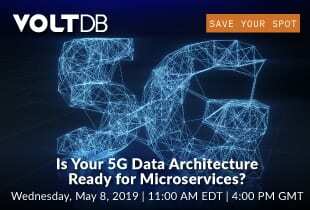 This flexibility provides enterprises, mid-sized businesses and developers with independent software vendors (ISVs) with the widest range of choices for their use of VoltDB, and future-proof capabilities to update or evolve their applications for rapidly-changing markets. Additionally, VoltDB v7.0 will be available on the Amazon Web Services (AWS) App Store. The latest version of VoltDB is currently available for immediate download here. For more information or to request a quote, please contact sales@voltdb.com. VoltDB’s SQL operational database is purpose-built to run 100% in-memory. Customers use VoltDB to build applications that process streaming data as fast as it arrives to make immediate, per-event, context-aware decisions. By delivering real-time in-transaction analytics that always produce correct results, VoltDB enables businesses to capture economic value and develop new revenue opportunities in the mobile, financial services, IoT, energy, advertising, and security industries. VoltDB is privately held with offices in Bedford, Mass. ; San Jose, Calif.; and Surrey, UK.